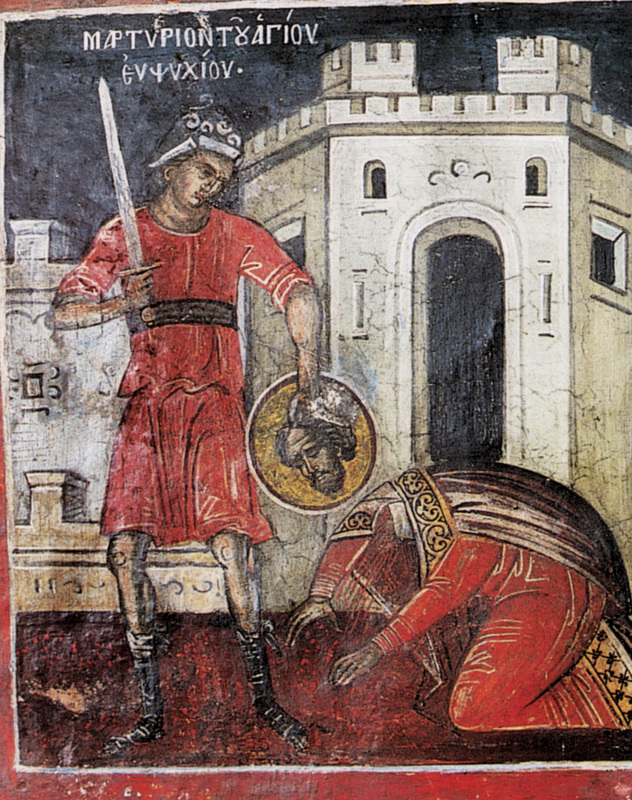 On the ninth Eupsychios was beheaded by the sword. The Holy Martyr Eupsychios was born in the city of Caesarea in Cappadocia and received a Christian upbringing by his illustrious parents. 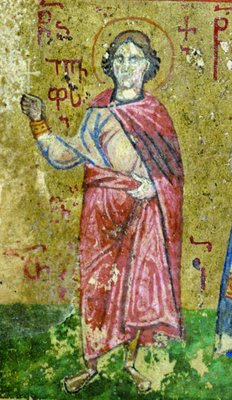 During the reign of Julian the Apostate (361-363), Eupsychios, who lived a blameless life, entered into a Christian marriage. At Caesarea there was a pagan temple to the goddess Fortuna, whom Julian the Apostate revered and offered daily sacrifices to. As Eupsychios was going to his wedding, the pagans were offering sacrifice to the goddess Fortuna. Eupsychios was filled with zeal for the Lord, and he took with him many other Christians and destroyed the temple. He knew that this would inevitably result in his punishment. Saint Eupsychios distributed all his possessions to the poor and prepared himself for martyrdom. The enraged emperor Julian loosed his wrath not only upon Eupsychios, but against all the inhabitants of this city. Some of the citizens were executed, while the more respectable were sent into exile. Christian clergy were drafted into military service, and he looted the churches of anything valuable. The city was deprived of its title Caesarea [i.e. “Imperial”] and resumed its original name of Maza. He also imposed a severe tax on the inhabitants. The emperor threatened to annihilate the city altogether, if the people did not build a new pagan temple in place of the one destroyed. 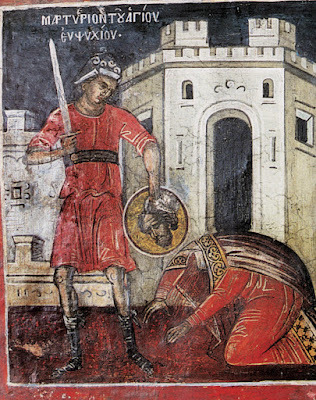 Julian tried to compel Eupsychios to offer sacrifice to idols. For many days they tormented the Saint on a rack, and also with iron claws. But his faith was firm, and the judge sentenced the martyr to be beheaded with a sword. He was thus suspended to a tree and beheaded, and instead of blood, milk and water flowed from the wound. After this he was honorably buried by Christians. Saint Basil the Great, who was Bishop of Caesarea at this time, instituted his feast to originally be celebrated on September 7th with other martyrs of Cappadocia (see Letters 100, 142, 200, 252, 372-376 of Basil and Letter 58 of Gregory the Theologian), and had a church built in his honor after the death of Julian where he was buried. In Letter 252 he even invites all the Bishops of Pontus to come and celebrate his feast, whom he calls "most illustrious among martyrs." After this the emperor continued on his way, but soon perished in his campaign against the Persians. He was struck down in the year 363 by the Holy Great Martyr Mercurius (Nov. 24). As mentioned earlier, after the emperor’s demise, the Christians of the city of Caesarea built a splendid church over the grave of Saint Eupsychios, and from his holy relics they received help and healing. * Obviously, Christ never went to Caesarea of Cappadocia, but the verse may refer to Caesarea Philippi where Christ indeed went. Either the author was in error mistaking the location of the martyrdom of Eupsychios in Palestine, or he is referring to the fact both cities bore the same name. With steadfast heart thou didst finish thy course, and cast down the wily foe; for thou wast clad in the armour of the Cross, O blessed Eupsychios. Thou wast numbered with the Martyr hosts, and hast attained to eternal glory. Ever entreat Christ our God to save us who honour thee. As a living temple of Christ the Lord, thou didst destroy the ungodly temple, and didst build a dwelling in Paradise, O Martyr Eupsychios, by thy steadfast toils in martyrdom.